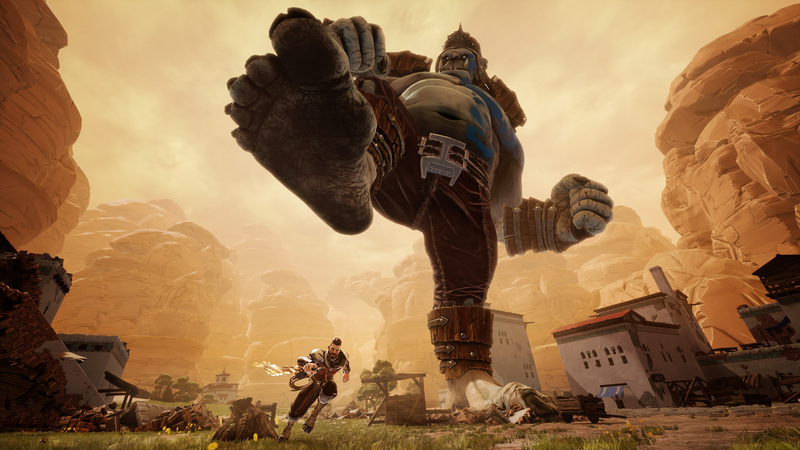 Extinction was announced on June 1, 2017, very little was known about the game other than it involved fighting against massive 150-foot tall ogres as well as countless hordes of other creatures. 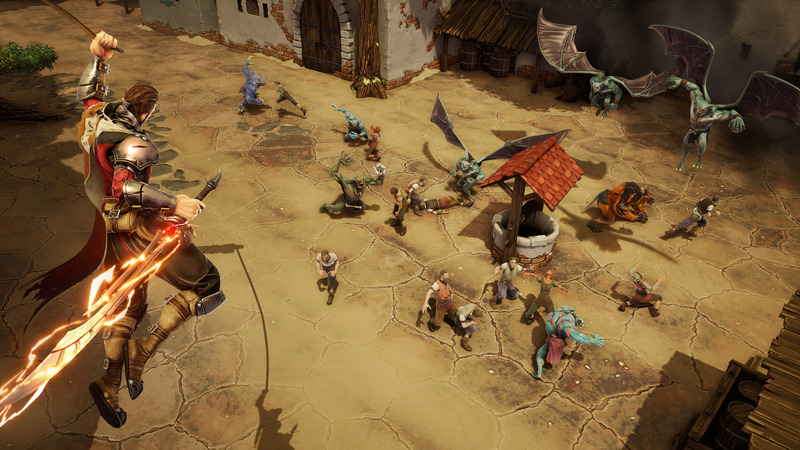 Iron Galaxy stated that the gameplay would be fast and fluid, and require players to ‘tactically disarm and dismember enemies’ in order to weaken them before they can be killed. Iron Galaxy are best known for providing technical consulting to larger developers, as well as specialising in porting games to different platforms. They are also often associated with fighting games, as they developed several seasons of Killer Instinct and were involved with Street Fighter III: Third Strike Online Edition; but they have also worked on titles such as Destiny and Batman: Arkham Origins, to name but a few. Whilst Iron Galaxy have been involved with more than 30 well-known games, the list of original titles they have developed is considerably shorter; with Extinction only being the 4th game that they have produced themselves. The plot unfolds through the use of several story-telling mechanisms, the majority of which occur during the campaign missions themselves. The protagonist-Avil-converses with other key characters at the beginning of each campaign mission, as well as throughout and occasionally at the end. These plot developments are fully voiced, and involve static graphical images of the characters involved in the conversation. Between each chapter of the campaign however, you are treated to superbly animated cut-scenes which provides the origin story of Avil and his childhood friend Xandra. These cut-scenes were fantastic to watch, and deliver some shocking plot twists further on in the campaign. The playful animation as well as the brightly coloured characters/monsters/environments are a stark contrast to the game’s subject matter however. 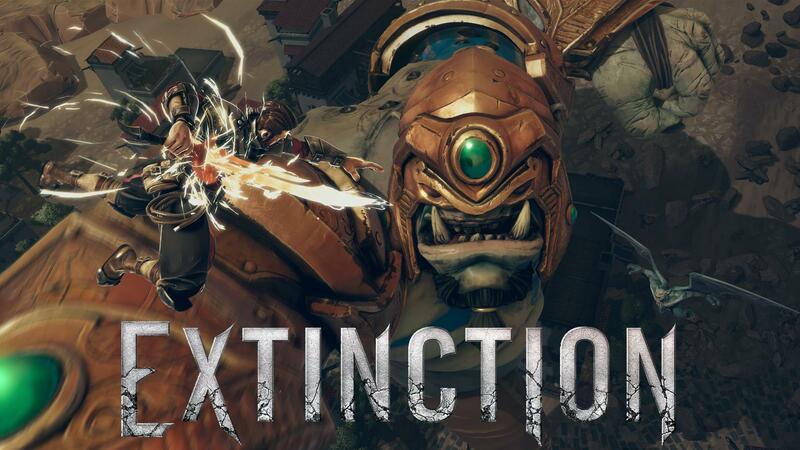 Extinction, at its core, is the dark and visceral story of humanity’s struggle for survival against the gargantuan Ravenii and their endless hordes of Jackals; their purpose is simple, to wipe the human race off the face of the earth. Whilst you will try your hardest to save every civilian possible, it soon becomes apparent that not everyone will survive; many games provide the fantasy of ‘the good guys winning’ and nobody getting hurt, this story focuses on mitigating casualties in order to ensure the human race avoids Extinction. Truly a tale of surviving rather than thriving. As Extinction is a DirectX 11 game, it runs extremely well on modern hardware. The minimum PC specs state: an Intel Core i5-760 (or AMD Athlon X4 740), 8GB of RAM, and an Nvidia GeForce GTX 660 (or AMD Radeon HD 7870). Whilst the recommended specs are an i7-4770 and GTX 970 (or comparable AMD components); as my setup exceeds those figures, the game ran as smooth as butter with all graphical settings set to their maximum. Depending on the resolution and frame-rate desired, I am fairly confident that the game should run quite well on a variety of hardware configurations. This also means good news for Streamers, as whilst the game is visually stunning, you should have plenty of CPU power left for OBS or XSplit to do their jobs (I never saw more than 20% CPU utilisation on my i7-4790K). Hopefully console players will also have a good experience, especially considering the pedigree of Iron Galaxy when it comes to bringing games to other platforms. Speaking of consoles, whilst the game can be played with a controller, I opted to use mouse and keyboard for my initial playthrough. This has nothing to do with any sort of predisposition that you think I may have, and that many associate with most PC Gamers, as I usually prefer (yes, honestly) to play games with a controller when possible. I chose mouse and keyboard because quite frankly the game feels lightning fast when you do, whereas combat and movement felt considerably slower with a controller. Having the ability to rapidly change direction during combat with the hordes of Jackals or whilst traversing a towering Ravenii was significantly helpful. The combat itself is where the pedigree of Iron Galaxy really shines through, as it is fast-paced and there plenty of combos to perform on the smaller enemies that are known as Jackals. You also have a considerably powerful attack known as the Rune Strike, this is the attack that allows you to dismember (and ultimately kill) the towering Ravenii. When Rune Strike is activated, time itself slows down, allowing you to position yourself and aim accordingly to strike where needed. It was not until much later in the game that I realised I could also use this attack to quickly vanquish the jackals as well. Frankly, it was a complete oversight-or even a rookie mistake-on my part, and using the Rune Strike certainly made dealing with multiple enemies at once much easier. Whilst the story itself is quite dark, Extinction does a good job of providing comic relief where it can. Xandra often pokes fun at Avil, and progressing through the campaign will certainly put a smile on your face in places. Even the combat, though graphic at times (you are dismembering these giants after all) never feels disturbingly violent. This is no doubt thanks to the playful animation style and the fact that you are battling against monsters rather than other humans. As you progress through the campaign, you will also find yourself being able to develop the skills of your character as you see fit. Upgrades range from increased HP or jump height, as well as increasing the mobility and combat capabilities of Avil as you unlock the different skill trees. Whilst these skill trees are not as extensive as the type of progression you would find in an RPG, for a game within the Action Adventure genre they give the player the opportunity to upgrade their skills in a manner with complements their play-style. In regards to the campaign itself, whilst the story is great and the cut-scenes are excellent, it is relatively short in the grand scheme of things. Even with a few failed attempts here and there, my first run through the campaign only lasted about 7 hours in total (you can watch the entire play-through here). But hear me out for a moment, similar to titles such as TitanFall 2, the campaign exists as the platform to introduce players to the universe in which the game exists, as well as prepare the player for the other game modes: Skirmish, Exinction, and the Daily Challenge. Skirmish mode allows players to create unique battlegrounds and challenge other players to compete for the top score online. There is no traditional multiplayer, which is a bit of shame, as the idea of being able to tag-team a Ravenii with a friend makes me think a great opportunity has been missed; the Skirmish mode at least allows players to try and top the leaderboards. Whether that will be enough to foster an online community for the game will have to be seen, but regardless it is a welcome feature of the game that will provide a fair bit of replay-value. 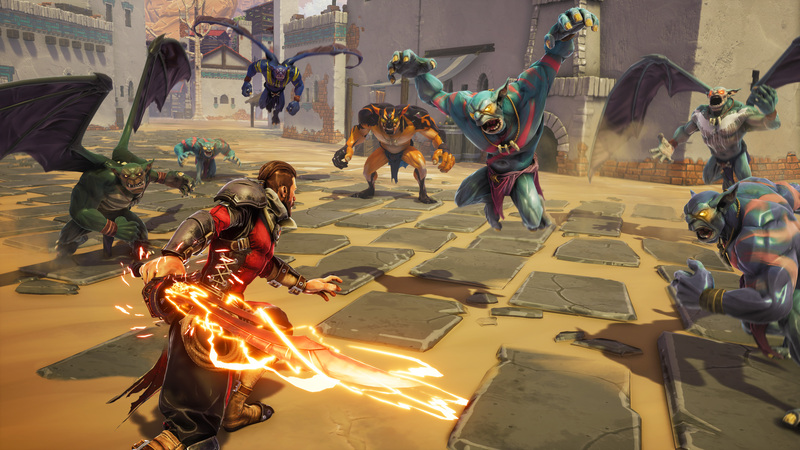 Extinction mode is effectively ‘Horde Mode’, fight off continuous waves of Jackals and Ravenii for as long as you can. This is the mode that would be absolutely fantastic if multiplayer was an option, I firmly believe that playing in a team of 4 (much like other horde modes in certain games) would really add to the experience of Extinction mode. Do not get me wrong, it is still a fun game mode; but as a single-player experience, unless someone really wants to receive the recognition of the ‘high score’, I think many will give it a few tries and move on. The daily challenges are self-explanatory (the clue is in the name), and at least give players somewhat of an unknown quantity as to what to expect each day. Whilst fun and a welcome addition to the game, I still do not know whether that is enough to keep players playing consistently after reaching their ‘saturation point’ with the other game modes. 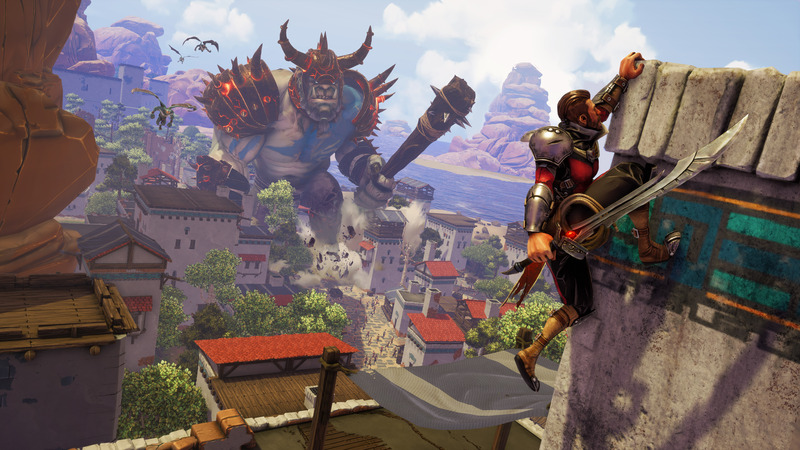 Extinction has a lot of great things going for it: stunning animation, colourful and crisp graphics, fitting musical score, fast paced action, skill-based combat, destructible terrain, and of course the gigantic brutes are the main staple of the game. I had a fun time playing through the game for this review, and will certainly be putting a little bit more time into the competitive game modes as well as create a few challenges of my own. I also find myself conflicted, however. As whilst the game is undoubtedly a lot of fun, I find myself staring at the price tag and wondering if it is ‘that much’ fun? With the campaign being relatively short, and the lack of any true multiplayer; my instincts are that this game should have been priced just slightly lower than what it is currently. But, when I open the game back up, and witness once again the beautiful world that Iron Galaxy has created; I think to myself that the price is actually quite reasonable. When you consider the time, effort, and passion that has been put into Extinction, I think the price of admission (which is somewhere in the middle of a AAA release and that of a smaller game) is warranted. If you want a fun experience that is not quite like any other game, then this certainly a success in that department. Iron Galaxy have created a beautiful and action-packed game, which is not quite like anything else out there. Replayability is the only issue, which lack of multiplayer further compounds. Next articleOne Year of Scholarly Gamers!